by Scupin, Raymond R, Ph.D.
MyAnthroLab should only be purchased when required by an instructor. 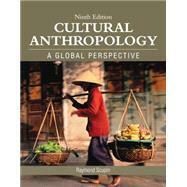 Introduction to Cultural Anthropology: A Global Perspective acquaints readers with the cultural discipline of anthropological studies. The text recognizes that in the nature of our 21st century world, humans need a much greater capacity for understanding different cultures than ever before. By examining classical and current research, the text brings readers closer to the theories, data, and critical thinking skills needed to understand global humanity. The Ninth Edition takes a comparative and interdisciplinary approach in its evaluation of topics such as human evolution, language divergence, and social developments throughout the world. By introducing readers to different perspectives of this global topic, the text provides a comprehensive introduction to the field of cultural anthropology. MyAnthroLab for Cultural Anthropology courses extends learning online, engaging students and improving results. Media resources with assignments bring concepts to life, and offer students opportunities to practice applying what they’ve learned. And the Writing Space helps educators develop and assess concept mastery and critical thinking through writing, quickly and easily. Please note: this version of MyAnthroLab does not include an eText. Cultural Anthropology: A Global Perspective, Ninth Edition is also available via REVEL ™, an immersive learning experience designed for the way today's students read, think, and learn. Raymond Scupin is Professor of Anthropology and International Studies at Lindenwood University. He is currently the Director at the Center for International and Global Studies at Lindenwood. He received his B.A. degree in history, Asian studies, and anthropology, from the University of California–Los Angeles. He completed his M.A. and Ph.D. degrees in anthropology at the University of California–Santa Barbara. Dr. Scupin is truly a four-field anthropologist. During graduate school, he did archaeological and ethnohistorical research on Native Americans in the Santa Barbara region. He did extensive ethnographic fieldwork in Thailand with a focus on understanding the ethnic and religious movements among the Muslim minority. In addition, Dr. Scupin taught linguistics and conducted linguistic research while based at a Thai university. Dr. Scupin has been teaching undergraduate and graduate courses in anthropology for more than thirty years at a variety of academic institutions, including community colleges, research universities, and a four-year liberal arts university. Thus, he has taught a very broad spectrum of undergraduate students. Through his teaching experience, Dr. Scupin was prompted to write this textbook, which would allow a wide range of undergraduate students to understand the holistic and global perspectives of the four-field approach in anthropology. In 1999, he received the Missouri Governor’s Award for Teaching Excellence. In 2007, Dr. Scupin received the Distinguished Scholars Award at Lindenwood University. Dr. Scupin has published many studies based on his ethnographic research in Thailand. He returned to Thailand and other countries of Southeast Asia to update his ethnographic data on Islamic trends in that area, an increasingly important topic in the post-9/11 world. He is a member of many professional associations, including the American Anthropological Association, the Asian Studies Association, and the Council of Thai Studies. Dr. Scupin has authored Religion and Culture: An Anthropological Focus, Race and Ethnicity: The United States and the World, and Peoples and Cultures of Asia, all published by Pearson Prentice Hall.